I finally got to meet one of my garden mentors, Dr Thomas Hemmerly. He was a hike leader at the annual Cedar Glade celebration at the Cedars of Lebanon state park a few weekend ago. I first "met" Dr Hemmerly about twenty-five years ago in the pages of his book Wildflowers of the Central South. He introduced me to concepts that were important to know if I were to have any success at gardening in my yard. I learned about Middle Tennessee microclimates and about the unique wildflowers that grew only in the cedar glades. His book helped me figure out that my garden was a xeric oak-hickory forest plant community with areas of extremely shallow soil and exposed limestone. The shallow, nearly neutral clay soil is hard as concrete during our dry summers and wet and sticky during our rainy winters. No wonder everything I planted had died! I mulled over what I learned and found myself thinking this: "Gail, your garden isn't a failure, but, trying to make it something that it isn't is the true failure. Take a look at what's already growing here. Appreciate and celebrate what you have." So I did. I decided to watch my yard throughout the growing season. I say yard because it really wasn't much of a garden back then. Early the next spring I noticed wildflowers everywhere. There were Columbines, Trillium, Spring beauties, Toothwort, False Garlic, Golden Ragwort and Phlox divaricata. In May, I found dozens of Penstemon calycosus growing in the wayback backyard in both the dry shade and in the the wet weather spring. I fell instantly in love and transplanted it everywhere! 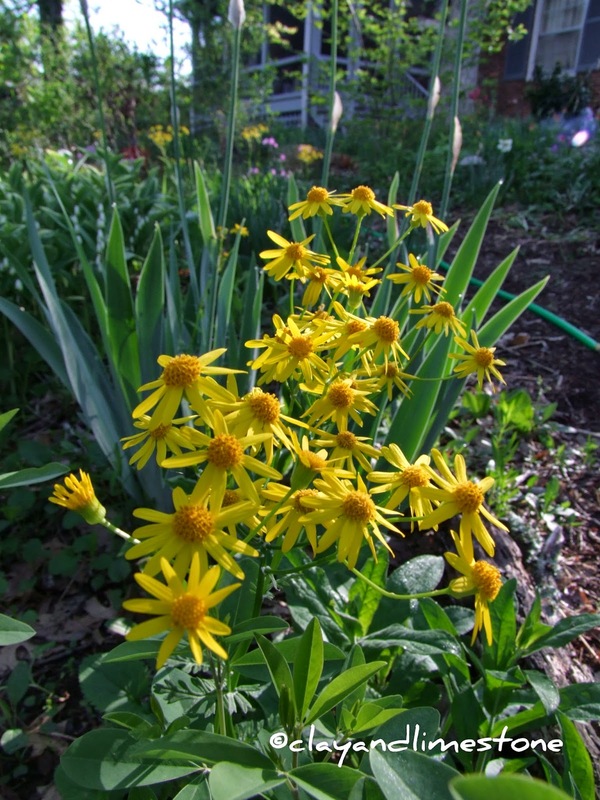 It's a foundation plant for my spring garden and a food source for many pollinators. Lyre leafed sage/Salvia lyrata~a delightful wildflower that honeybees visit. Also growing in the lawn were Blue-eyed grasses, Downy Woodmint, the cutest little panicums and a tiny daisy with lavender hints that wasn't even in my wildflower guide. That sweet little daisy is Entireleaf Western Daisy a Middle Tennessee native (annual) that I have allowed to spread where ever it is happy. It's happy in sun or shade. Later that spring the old world irises that were planted by the former owner bloomed and the Green Dragon dramatically unfurled. Summer brought the Phlox paniculata into bloom and later that fall I noticed that the yard was a blue sea of native woodland asters with pops of golden colored Goldenrod. With new eyes, it was easy to see that my difficult garden was a treasure. 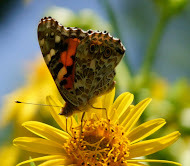 There was a forest of native trees, thriving wildflowers and abundant wildlife. In other words, the makings of a perfect wildlife garden. After months of struggling to figure out what was going on, I finally understood that plants have to be rugged to survive in my garden and that planting native wildflowers made sense. After all, they had evolved and adapted to our wet winters and dry summers. Thank you Dr Hemmerly for all your help on my journey to the garden of my heart. PS This is also my Garden Bloggers Bloom Day contribution. Please stop by Carol's blog, May Dreams Gardens, to see more flowering gardens then you can imagine. Gail how exciting to meet you idol...and fabulous memories and wildflowers in your garden. it's all beautiful, natural and so you. i love your journey to becoming the native planter you are. 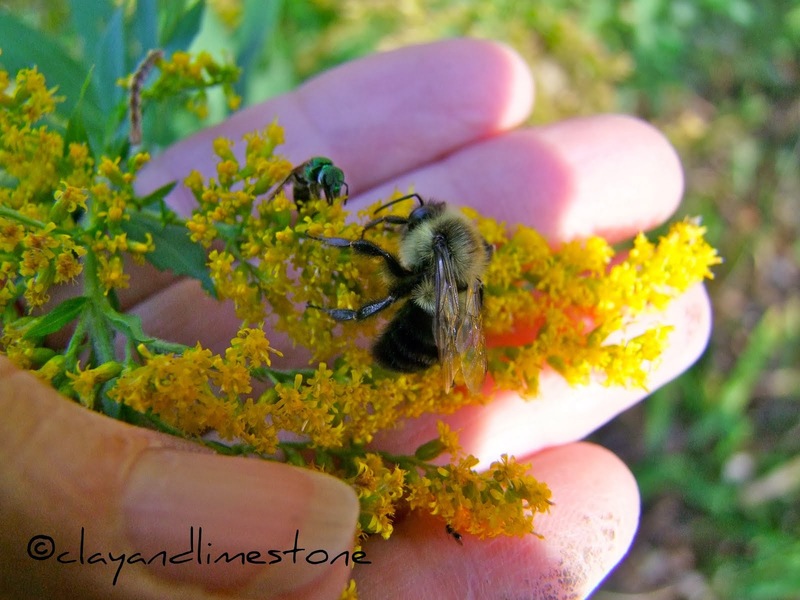 Wonderful story of meeting someone who inspired you and weaving in the beautiful wildflowers demonstrates you have found success in your garden. I enjoyed your story quite a lot because I am learning that finding the plants that grow best in your area and encouraging them is not only special it's easier. I can completely identify with that feeling of finding someone who imparts a revelation to you about your garden (or indeed about anything). It's so satisfying to find a good teacher. Oh my goodness...the Blue-Eyed Grass makes my heart flutter! It's native here, too, and so exciting to find in the wild. How wonderful to meet one of your garden mentors! This is such a great post - inspiration to anyone in a similar position and heartwarming too! 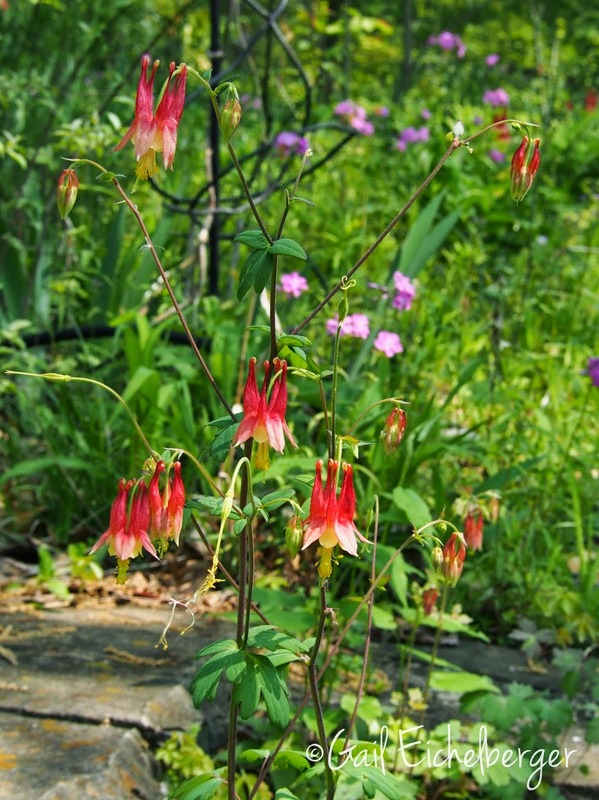 You have a fabulous variety of natives and the photos are simply beautiful too! Your gardening journey sounds a lot like mine. We moved to the woods and I couldn't understand why all the plants I brought with me from town wouldn't bloom or died altogether. Found out our many, many walnut trees was a major reason as well as our shadiness and heavy clay soil. Spent 2 years just hiking, noting, learning the names of, and making a calendar of what blooms when which I did find in our woods, along our creek, and in other books and blogs like yours. Go Native! was my book of enlightenment and fueled my passion for native plants. Lovely, and a lesson for all of us in your garden. Gail, you've always been an inspiration with your knowledge of wildflowers and pollinators. This lovely post is another way of inspiring all gardeners to learn what works for them and to watch Mother Nature's own plan. No wonder your garden is so beautiful! Hello Gail, your photos are always so crisp and awesome. Photos really make the flowers more desirable. That first one as well as that with a bee are my favorites, amazing details. I hope i can do something for the WFW. So glad you got to meet Dr Hemmerly. His book is a treasure in our collection. Mike had the fortune of having him as a professor at MTSU and he has visited us several times. Getting to meet a gardening mentor is so satisfying. Glad you got to not only meet him but to do it in his stomping grounds is doubly good. As always your blogs are wonderful and your pictures always tell a story. I'm fortunate enough to have a wealth of native plants in my 2 acre yard too, but unfortunate enough to have to struggle with invasive foreign plants as well. It's great that you were able to connect with the native plants growing there and appreciate them. It's tempting to collect exotic plants from all over the world, some do, but I especially enjoy plants that are actually created for my growing conditions, and fit in without much effort on my part. Your native plants are an inspiration. I think most beginning gardeners have to learn the same lesson, to go with the conditions you have. (The ones that don't learn either have a lot of money and time to fight Mother Nature--or give up gardening as too hard.) I love discovering natives growing in the wild that I previously had only seen in field guides! Fabulous Gail. It is a blessing to get to meet someone that has meant so much to your gardening. Happy GBBD. your garden is so much more enticing and interesting than the same old same old commonorgarden. Longing to turn our next garden to fynbos. It's amazing what gardeners can accomplish when they work with nature, rather than against it. You are so lucky to figure out exactly what works in your garden. I've been here ten years, and every time I think I have it figured out, nature throws me a curve ball. Every year, the rain turns off in June, and so I planted all these drought loving plants. But every few years, the rains stay, and my drought lovers all begin to drown. Argh!